A popular industry magazine found its way to my desk this week. An article that described five essential “wisdoms” for producing quality cattle piqued my curiosity. According to the author, the first key is “Be fanatic about animal health.” Key number two is “Pay the extra money for a good bull and build a reputation for quality cattle.” According to the article that “will come back ten-fold when it’s time to market your calves.” Really? Instead of $1.60 a pound I’ll get $16.00 a pound? The article did get me thinking about principles that are important to producing quality cattle. The obvious prerequisite is to define what quality cattle means. If you are ranching for profit, there is only one possible definition. It doesn’t matter how big or old an animal is. It doesn’t matter what color it is or what pedigree it has. It can have one eye or three. Quality cattle are cattle that make you money. More specifically, quality cattle are cattle that produce a healthy gross margin. Gross margin measures the economic efficiency of production. Rather than measuring the productivity of an animal, it measures the value of an animal’s production relative to the direct costs required to support that production. Which are the quality cattle: A herd of sleek black cows with 95% conception rate and an average of 600 pounds per cow with a gross margin of $300 per animal unit, or a herd with cows that are every color imaginable, that have a 75% conception rate and produce a gross margin of $500 per animal unit? If you are ranching for profit the answer is OBVIOUSLY the second herd. Fit the enterprise to the resource. It doesn’t matter how productive your cows are if you shouldn’t have cows. You can cram a square peg in a round hole, but it is expensive, exhausting and unsustainable. Fit the production schedule to the environment. Why don’t elk in Montana calve in March? It’s because nature’s production cycle is in synch with the seasonal availability of forage and because photoperiod has a big effect on the seasonal fertility of ALL grazing animals. This isn’t to say that everyone should be calving in late May or June. But being able to reduce hay feeding by $200-$300 per cow probably adds more value to most ranches than the extra $100 you might get for the calf weaned by the cow that consumed all that hay. Find animals that fit the environment. 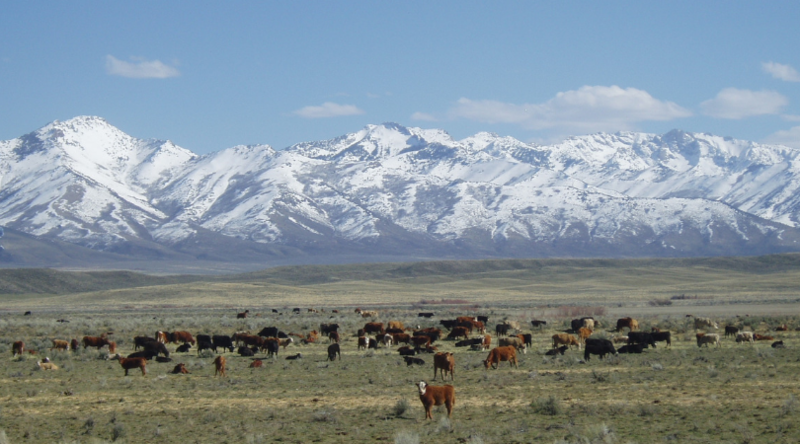 Hot and humid or cold and dry, subtropical or temperate, prairie, mountain or desert, a cow that works in one environment may not be suited to another. That goes for the production schedule too. A cow selected to be productive in a March-April calving program may not be fit for a May-June calving program. Hit depreciation head on. For most producers the biggest cost of keeping a cow isn’t feed, rent, or labor. It’s depreciation. We rarely even think of depreciation as a cost of keeping a cow, let alone the biggest cost! In a typical herd, depreciation averages $250-$350 per cow per year. That’s $250-$350 ON EVERY COW EVERY YEAR! Many Ranching For Profit grads have drastically reduced depreciation in their herds. Some have even eliminated it. In my mind’s eye, cattle that don’t depreciate are quality cattle. Come up with a replacement strategy that works. Most cow/calf producers have no idea of the REAL cost of raising their own replacements. The gross margin of a productive cow is almost always at least a couple hundred dollars higher than the gross margin of H1’s or H2’s on the same ranch. There are alternatives to raising your own replacement heifers. You can contract with someone else to raise them, buy them, or buy older, depreciated cows as your replacements. It is a breakthrough for some producers to realize that they don’t need replacement heifers. It’s not heifers they need to replace, it’s cows. That paradigm shift opens the door to several profitable opportunities. These five principles can help you improve the economic efficiency of any kind of livestock. Please share with me and ProfitTips readers the principles you’ve found essential to producing quality (high gross margin) livestock. Very well said on a concept that is too often misconstrued by the livestock industry. This cannot be repeated often enough. Great reminder of the importance of GM/Unit. Seek cows that have a high potential of being re-sold as replacement cows nine months down the line. Alternatively, seek cows that have high potential for increased value in a very short time. Seek cows that have been terribly mis-managed by their former owners. Result: I buy cows that appreciate rather than depreciate. Note: It’s not easy. Buying cattle is the highest value work I do, and the most difficult. Growing up in one of the highest seed-stock producing areas in the nation, this has been a MASSIVE paradigm shift from the high-quality=high production= how it oughta be done mind set that we’ve all brainwashed ourselves with. As long as they stay sound (bad feet are a real issue), raise a calf, & show up pregnant every year; they meet my requirements. At least at this point. A lot more to be said here, but you get the drift. .As I work at this I am turning in to a a heifer man because of those two points for income.Buying or keeping a set of heifers and running them as feeder heifers ,selling them as they fall out makes for good cash flow and selling the ones that make it to second or third calf cows is great for building wealth( Not having self employment taxes and able to capital gains the gain in value of the cow) . >Great job Dave! Spot on Wally! Years ago we were buying other people’s culls as our replacements. By knocking all of the depreciation out of the cows (at that time about $300/cow/year), you didn’t have to be very productive to have a VERY high gross margin/unit. Our conception rate was much higher than 75%, but that’s not the point. The point is that no production measure matters unless you are profitable. We ought not try to maximize production, we should be trying to optimize it … to find the sweet spot between the value of output and the cost of achieving that output. That’s what gross margin per unit measures. The most productive cow herd is NEVER the most profitable (because of the cost of supporting that production) and Gross Margin per Unit is ultimately the only production metric that really matters. If gross margin is bad, some production and cost statistics can help us find out why it’s bad. But we can only assess if the other statistics are “good” in the context of gross margin. For example, if I have a 100% weaning rate, but my gross margin is bad, I would conclude that the 100% weaning rate was bad. Bringing this back into the real world I am familiar with cull cow enterprises and H1 and H2 enterprises with conception rates of 75% or less that have very good gross margins. All these comments and ideas touch on this but there needs to be sometime in the 12 months that the grass or available feed/forage/environment add major weight and quality to cattle and/or their offspring. Obviously grazing is the key to cheap weight gain but where we are at in Minnesota we do not see the big or cheap gains. Obviously we need pasture improvement through cell grazing or some other non input improvement such as water etc. Too often I feel that maintaining a BCS herd of 4.5, raising very average calves of average value with a fair amount of inputs of grain/hay/etc is the status quo. My goal and free advice is to figure out where in the 12 month cycle and what type of animal can we get the big and cheap weight and quality gains. Not having cows in the winter is a great idea for Northern environments. Early weaning, grazing corn stalks, cheap feed, dry cows in the summer months really add weight. All good ideas and challenges. “H” stands for heifer. The number refers to the number of breeding opportunities the heifer has had. H0: Weaned heifer calves that are kept for breeding but that will not be bred the 1st year. This classification only applies to animals that will have their first calves as 3 year olds. After weaning, most bison heifer calves are H 0. H1: A weaned heifer calf kept for breeding. An H1 typically will have her 1st breeding season at 13 to 15 months of age. If she is confirmed pregnant she becomes a H2. H2: Once an H1 is confirmed pregnant she is an H2. She will have her 1st calf and be exposed to a bull for a 2nd time. When her 2nd pregnancy is confirmed she becomes a cow. Here’s my question, why do the high quality cow herds you talk about always come with a lower gross margin?. Why are the mixed herds you talk about cheaper to create than a nice set of black cows? Why not strive to create a highly marketable animal with the same minimal input costs? Last point first. Let’s do that… let’s “create highly marketable animals with minimal inputs.” That will produce a good gross margin/unit (my definition of a good cow). The point is that the conception rate (95% or 75%) doesn’t matter if the gross margin/unit is bad. We are hitting bull’s eyes on the wrong target, shooting for production rather than profit. The paradigm most producers seem to be stuck in is that higher production is the goal. But the most productive herd is NEVER the most profitable, at least in all the years I’ve been looking at the numbers, it hasn’t been. Perhaps if this business weren’t so much about image, more people would get it. Look, I am not saying production isn’t important, but the cost of getting that production is every bit as important. « What is Sweat Worth?